Considering that the Bell Custom 500 is one of the most classic motorcycle helmets still available from any helmet manufacturer, there is not much information left to share in regards to its timeless design and function. Bell has continued to updated this helmet over the years with premium quilt stitched lining, over 5 different shells, and numerous limited designs. This fall, they have decided to extend their scope of designs by including a few new stylistic offerings. 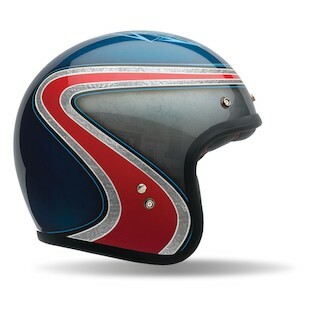 The first up is the newly designed Bell Custom 500 Airtrix Heritage Helmet. This particular helmet incorporates Chris Wood’s vibrant display of design skill with a slick combination of blue, red, and silver colors. It is certainly not a subtle display of his skillset, and will definitely catch anyone’s eye on the road. 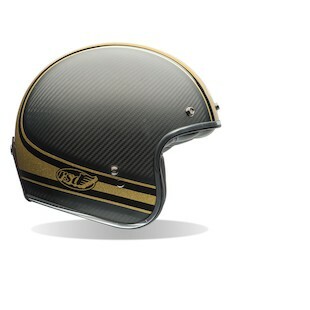 The next style to mention in this review will be the Bell Custom 500 Carbon RSD Bomb helmet. As always, Roland Sands has a very particular approach to his designs, incorporating a carbon weave, with not so subtle gold striping throughout. With a carbon shell included, this helmet will certainly be lightweight, and offer a more sophisticated look for the rider. Last, but not least, Bell has decided to include a very classic looking Bell Custom 500 Stripes helmet. This design is a bit more subtle than its stylish siblings, offering some red and blue striping along what would be a simple pearl white paint finish. Take it back to the old school, take it back fast, and take it back in style! Well done Bell. 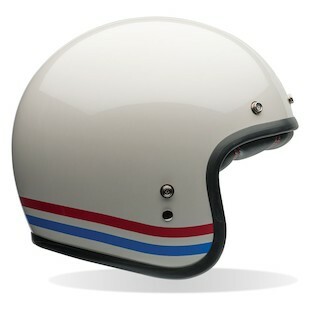 In conclusion, I applaud Bell for continuing to offer new designs for a seemingly simple and classic motorcycle helmet. I look forward to seeing a few riders out there combining their own custom machines with these stylish offerings.